to the beach, dinner at the dedicated restaurant in front of the sea... Le Dune is also a good choise for a family up to 3 people, also located close the Children's Wonderland. 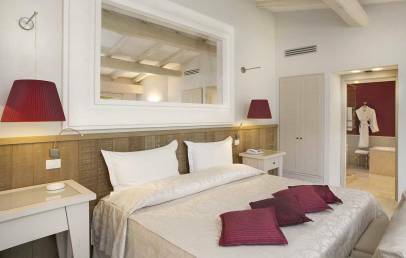 Hotel Le Dune is part of the Forte Village Resort, located on the Sardinian south western coast, in Santa Margherita di Pula, 45 km from Cagliari. The Resort is known for the quality of its services and since years it is still the holder of the primacy of Best resort in the world. The 5 star Hotel Le Dune is located in front of the beach, in a private area of the Resort and consists of 38 Bungalows and 50 luxury Suites with patio and garden area, all furnished in a modernstyle. The spacious Bungalows are equipped with bathroom with bath tub (some with Jacuzzi) and shower, air conditioning, TV LCD, minibar, safe, some have a lounge area with sofa which can, upon request, be transformed into a third bed. The luxurious Dune Suites are equipped with bathroom with Jacuzzi and/or shower, air conditioning, TV LCD, minibar, safe, DVD player, some have a beautiful panoramic terrace. Modern sports facilities offer several alternatives: football (3 football fields with stands, a regular grass field), tennis (12 tennis courts with artificial lighting), gym, water sports, scuba diving and 18-holes Golf Club 8 km away "Is Molas Golf Club"), thanks to the constant and essential presence of qualified instructors. The guests of the Forte Village Resort could taste the dishes of the Sardinia traditional cuisine, but could also delight their senses with the flavours and colours of the best dishes of national and international cuisines. The restaurant for the guests staying at the Hotel Le Dune is the Restaurant Le Dune available for breakfast and dinner, located along the beach and offers a spectacular view over the sea with table service, à la carte menu and hôte nuovelle cuisine. Further restaurants open for dinner, not included in the half board, available with a supplement (table reservation required) are: Forte Gourmet, Terrazza San Domenico, Hell’s Kitchen, Forte Bay Terrace. The Forte Village Resort offers its guests a wide selection of entertainment and leisure, which meet the needs of adults and children. For people who need to relax, the swimming pools (six for adults and three for children) are available to the guests; people who want to go shopping, can visit Piazza Maria Luigia and her Galleries (perfumes, jewellery, tobacconist, newsagent and several boutiques of the highest level), place of meeting, centre of the social life at Forte Village Resort. City tax – The municipality of Pula requires the payment of € 2,50 per person/overnight to be paid on spot. Children under 12 years, disabled people and their assistants, business travellers and students are exempted. 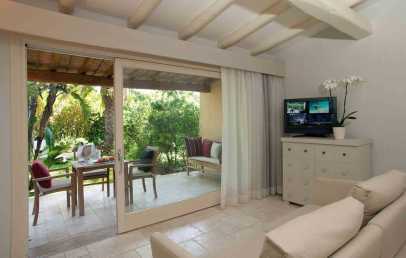 Luxurious and comfortable double bedroom with a living corner furnished in a modern style. The private bathroom has a bathtub, a Jacuzzi or a shower. 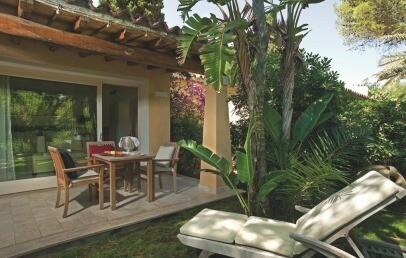 The Bungalows Deluxe has a private garden area with equipped patio. Some Bungalows are located side by side with the possibility to connect the internally and on request, a cot or an extra bed can be added.